Before I get to this recipe I want to congratulate the winner(s) of the DUTD cookbook giveaway. I was SO beyond touched by the spirit of your comments and paying it forward ideas that my heart has been so full. I wish I could donate a book to every single one of you. However, since that’s not in the budget I’m going to pay it forward by donating the book to two winners instead of one. Congratulations Rachel and Eddie. Taylor picked the numbers randomly and I’m really happy with the folks who will be receiving the book. Rachel is on summer break from high school and is planning to pay it forward by cooking dinner for her hard working dad so he can take a break from cooking in the evenings after a long day. I so love this! And the second winner is Edie who belongs to a CSA with her husband and wants to gift the book to her hard working farmers. I hope they find some inspiration in the book. Congratulations to you both! Alright, let’s chat about this granola! 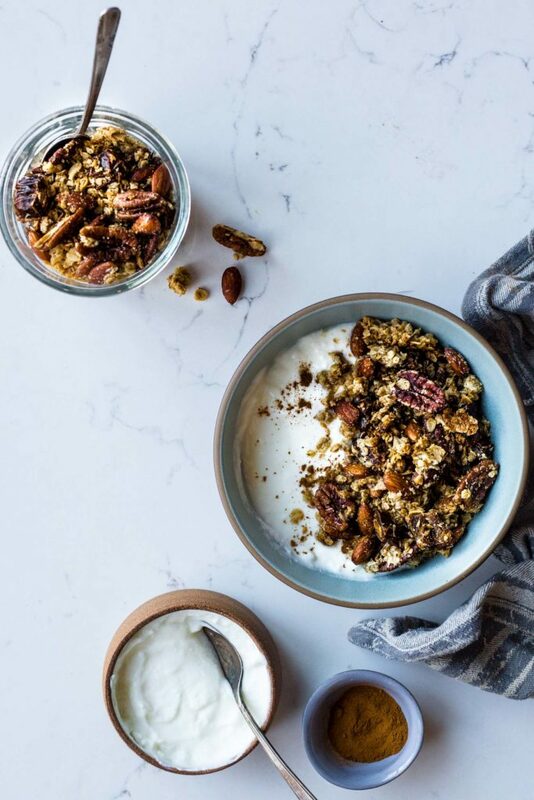 This granola has everything I love– Sweet local honey, pungent cardamom and nutty tahini. All the flavors blend together really well and I love how this turned out. For this recipe I highly recommend using a good quality Tahini. I love my gals from Soom Tahini because their quality is top notch. The consistency is really wonderful and you don’t need to stir! Perfect for mixing in with dry oats, nuts and seeds. Taylor and I have been enjoying this in the mornings with yogurt but I also love sprinkling this on vanilla ice cream in the evenings for a tasty dessert. By the handful isn’t half bad either! Whichever way you choose to serve this I think you’ll be pleasantly surprised by how tasty this simple recipe is. Preheat the oven to 350F. Line a large rimmed baking sheet with parchment paper and set aside. In a large bowl mix together the oats, coconut, nuts, seeds, spices and salt. Add the oil, honey, tahini and vanilla and stir until well combined. Spread the mixture out onto the prepared baking sheet and use a wooden spoon to help spread it in an even layer. Bake until the granola is a deep golden brown, about 25 minutes. Stir halfway and rotate the pan. Remove the granola from the oven and let it cool completely before breaking it up into clusters and adding the chopped dates. Store in an airtight container at room temperature for 7-10 days. Although I didn’t “win” – I did win – my idea was to be kind in my daily driving for a week. I have remembered when I have gotten in the car and found daily opportunities to be gracious instead of as pushy as others. It has benefited me a lot – feel so much better when I drive and arrive without anger! I plan on this being my new way of being. I’m sure you didn’t intend this as a benefit of your book win – we never know the consequences of what we do! Thanks! sillygirl it was so nice to read your comment. Being kind to others does make you feel better. If only everyone could adopt this concept. The moment I came to your page and saw this recipe, I was like “oh hell yes”! Can’t wait to try this, whipping it up this weekend. Awesome! I hope you enjoy it as much as we do! Looks delicious, I love granola and I love tahini so its perfect! thanks for the sharing. Loved the flavours! We actually adapted and made into a baked oatmeal. Will try the original granola recipe soon. How big is a large size baking sheet? Bigger than a regular cookie sheet? BEST GRANOLA EVER!!!!!! So good my only problem is not eating it all at once!